This Boat Stencil Kit will help you to neatly write your boat name on your tender. 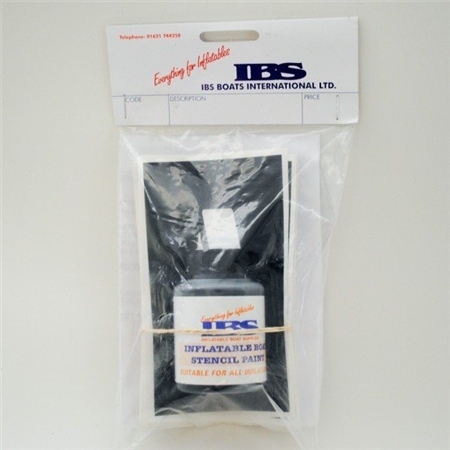 Apply registration numbers and letters directly onto your PVC Inflatable or Rib using this kit which comprises of numbers 0-9, complete alphabet 3” high, 60 ml paint, container with brush and instructions. Available in Black or White. This item is classed as a HAZARDOUS PRODUCT and has delivery/courier restrictions. Unfortunately, delivery cannot be made to addresses with the following GB postcode prefixes: BT1-BT99, GY, IM, JE, KA27, PA41-PA78, PO30-PO41, TR21, TR25. Customers from Barra (HS9) wishing to purchase this product should contact us first for a quote on delivery. We cannot deliver hazardous goods outside UK.